Shipping Cost Shipping charges are based on the weight of your order. Just add the intended items to your shopping cart and shipping charges will be displayed for your zip code. Keep in mind that glass items can be heavy, and plastic and tin items can have a high "dimensional weight," making them expensive to ship. 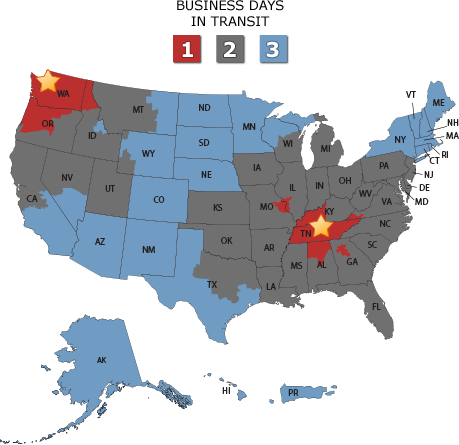 Time in Transit Most orders are processed and shipped within one business day, and time in transit is normally one to three business days. Orders over 150 pounds and orders shipped on a pallet can take an extra day or two in transit. Our distribution centers are located in Seattle and Nashville. Use the map below to determine the approximate time in transit to your location. Canadian and International Shipments Shipping cost can be estimated online for shipments to Canada and do not include brokerage costs, duties or other border fees. For orders outside the US and Canada, please contact us for shipping costs.